Teardowns: Up With the New and Down With the Old? "Up with the new and down with the old!" reads the ad by a Washington, D.C. realtor promoting teardowns to give the property owner the "best of both worlds -- a new home in an established neighborhood." But this practice of bulldozing older homes to replace them with updated -- and usually substantially larger -- ones is alarming to many planners, neighborhood groups, and preservationists. This so-called "mansionization" trend is dramatically changing the scale of traditional neighborhoods, threatening affordable housing, and altering historic properties -- most often in modest, post-war housing developments that once offered entry-level housing. A post-World War II subdivision in Concord, Massachusetts. 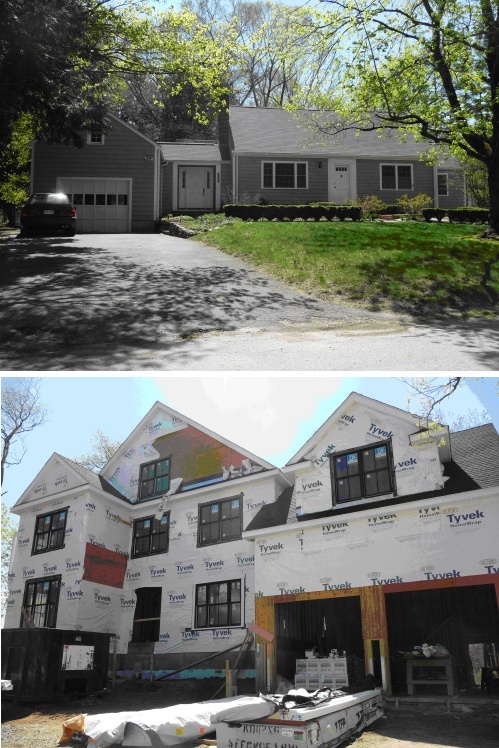 illustrates the "old" and the "new" in the teardown-mansionization trend. Photos by Beth Humstone. Even with the cool-down in the housing market, communities in different parts of the country are wrestling with this issue. This is especially true for "first ring" suburbs that are attractive for their proximity to jobs (lower commuting costs) and lower prices (small lots and house in postwar subdivisions) and in scarce waterfront locations. But we can expect that more communities will again face the problem of teardowns once the housing market improves. What better time to plan than now while there's some breathing space? Teardowns are not new. In 2002 the National Trust for Historic Preservation cited teardowns as one of the most significant threats facing historic neighborhoods across the country. In 2008 the Trust documented teardowns in more than 500 communities in 40 states. Suburbs within easy commute to jobs and close to shops, services, and public transportation are increasingly popular. However, prospective buyers also want up-to-date homes with large, multistory spaces, multiple bathrooms, energy efficiency and two- or three-car attached garages. If local zoning allows for very large structures, the older ranches, split-levels, and capes found in many suburban neighborhoods will be ripe for teardowns. Why are teardowns a problem? After all, infill development is often encouraged as an efficient way for communities to grow because it uses existing utilities and services, helps to prevent sprawl, reduces traffic, and revitalizes depressed neighborhoods. Yet, not every neighborhood is appropriate for new housing that is out-of-scale with the area's existing housing stock. 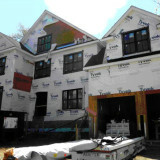 -- The replacement by higher-priced homes of housing that is more affordable. -- Destruction of the scale and existing character of a neighborhood. -- Loss of historic resources, including Mid-Century Modern homes. -- Rise in property taxes throughout the neighborhood. -- Environmental impacts, including tree removal, reduction in green space, loss of sunlight, and increased stormwater runoff. -- Disposal of demolition debris. ... bulk of the article then focuses on ways of dealing with teardowns, including a range of planning and regulatory strategies. Beth Humstone works as a planning consultant on a wide range of projects in rural communities and small towns. She is an advisor to the National Trust for Historic Preservation; former Executive Director of the Vermont Forum on Sprawl (now Smart Growth Vermont); a past member of the Burlington (VT) Planning Commission; and former Chair of Vermont’s Housing & Conservation Trust Fund Board. Humstone is co-author, with Julie Campoli and Alex MacLean, of Above and Beyond, Visualizing Change in Small Towns and Rural Areas (APA Planners Press, 2002).